Green Party nominee Jill Stein appeared to have met her initial fundraising goal early Thursday for recounts of the vote in three key swing states that went to Donald Trump — Michigan, Pennsylvania and Wisconsin. However, she quickly raised the sum being sought by another $2 million. "Raising money to pay for the first round so quickly is a miraculous feat and a tribute to the power of grassroots organizing," a message on her website read. The Green Party did not single out any specific evidence of fraud, nor does it need proof of irregularities to call for a recount. Stein's party won only 1 percent of the vote. "After a divisive and painful presidential race, reported hacks into voter and party databases and individual email accounts are causing many Americans to wonder if our election results are reliable," Stein said on Wednesday. "These concerns need to be investigated before the 2016 presidential election is certified. We deserve elections we can trust." A small but vocal group of scientists and activists have emerged in recent days advocating for a recount on the basis of Trump's wholly unexpected win and concerns about Russian involvement in the election. They note that only a small minority of public polls predicted Trump's success, and though public polls have been wrong before the magnitude of their error this cycle was unprecedented. They also point to evidence Russian hackers infiltrated the Democratic National Committee and potentially a top adviser to Hillary Clinton's campaign as evidence of both ability and willingness. Hackers compromised voter records in Illinois and attempted to breach voting systems in a handful of other states prior to the election. Clinton's campaign officials have not commented on Stein's efforts, which hinge on the Green Party's ability to pay for a recount. Hillary Clinton walks from the stage after speaking to the Childrenâs Defense Fund in Washington, U.S., November 16, 2016. Hillary Clinton pauses as she speaks at the Children's Defense Fund Beat the Odds Celebration at the Newseum in Washington on November 16, 2016. Former Secretary of State Hillary Clinton receives a standing ovation while being honored during the Children's Defense Fund's Beat the Odds Celebration at the Newseum November 16, 2016 in Washington, DC. This was the first time Clinton had spoken in public since conceeding the presidential race to Republican Donald Trump. Former Secretary of State and former Democratic Presidential nominee Hillary Clinton delivers remarks while being honored during the Children's Defense Fund's Beat the Odds Celebration at the Newseum November 16, 2016 in Washington, DC. This was the first time Clinton had spoken in public since conceeding the presidential race to Republican Donald Trump. Hillary Clinton and Marian Wright Edelman, founder of the Children's Defense Fund, wave before Clinton speaks to the group in Washington, U.S., November 16, 2016. Hillary Clinton arrives at the Children's Defense Fund Beat the Odds Celebration at the Newseum in Washington on November 16, 2016. Hillary Clinton speaks to the Childrenâs Defense Fund in Washington, U.S., November 16, 2016. Hillary Clinton is seen through a teleprompter as she speaks at the Children's Defense Fund Beat the Odds Celebration at the Newseum in Washington on November 16, 2016. On Wednesday, Stein told supporters she needs to raise "over $2 million by this Friday, 4 p.m. central" in order to put her plan to action. The deadline to file for a recount in Wisconsin is Friday, while the deadlines for Pennsylvania and Michigan are next week. Recounts are costly to conduct, and each state requires various fees depending on the size of the vote lead and how expansive the recount is. She surpassed her website's original $2.5 million goal by 3 a.m. ET on Thursday. Within around 20 minutes, the sum had been increased to $4.5 million. 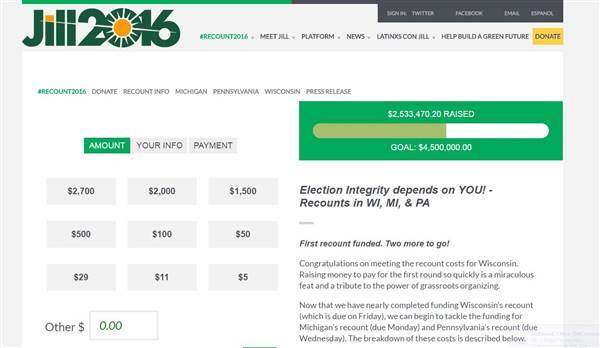 "Now that we have nearly completed funding Wisconsin's recount (which is due on Friday), we can begin to tackle the funding for Michigan's recount (due Monday) and Pennsylvania's recount (due Wednesday)," a message on her site read. "In true grassroots fashion, we're turning to you, the people, and not big-money corporate donors to make this happen." A recount wouldn't change the outcome for Stein. She came in fourth, behind Libertarian nominee Gary Johnson, Democrat Hillary Clinton and Trump, taking a little less than 1.4 million votes overall. But there's a very small chance that a recount in those states could boost Clinton. Trump won Michigan by about 9,500 votes, Wisconsin by 22,500 votes and Pennsylvania by 69,700. Given the relatively wide margin for Trump, and Clinton's narrow advantage in more traditionally blue states like Minnesota, it's unlikely compromised voting machines were to blame. Most political observers agree the more likely reason for Clinton's loss was an unforeseen breakdown in the Democratic turnout machine in key states, and Democrats simply staying home. There was no evidence of any vote tampering on Election Day, and even flipping one state in Clinton's favor wouldn't give her the Electoral College votes needed to win. Last week, two experts advocating for a recount, voting-rights attorney John Bonifaz and J. Alex Halderman, the director of the University of Michigan Center for Computer Security and Society, made a phone call to Clinton campaign officials. The voting experts urged the campaign to file for a recount in key states, but their efforts, one person on the call said, were rebuffed. "While many of us were hoping Clinton's campaign would pursue this, it seems clear they won't, because they said there's no clear proof of fraud" at the ballot box, which candidates typically cite in calling for a recount, that person said. The source said it was clear the Clinton advisers were also concerned about not disrupting the transfer of power or causing further unrest over the Trump presidency, which has already sparked protests and marches across the U.S. in the weeks since Clinton conceded and Trump became president-elect. But proof of fraud is both "usually unattainable and also unnecessary" in many states to file for a recount, the person on the call said, and at the very least it would allay concerns from voters who insist the results of the election don't reflect them. "There's either a huge subset of hidden voters that didn't tell pollsters how they were going to vote, or something went awry with those voting systems. If we can X out that second option, why not?" the source said.